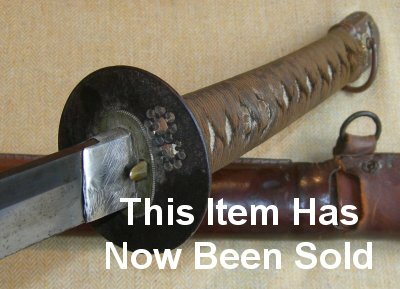 A part civilian Imperial army officer's shin gunto in overall good condition, with iron tsuba and "cat scratch" silver habaki, unsigned gendaito. A rare variant of the Imperial Japanese army officer's shin gunto. This one has a non-standard iron tsuba plus solid silver habaki. Because the tang has two mekugi-ana (tang peg holes) and because the blade is clearly period, the blade was clearly first mounted probably as a civilian wakizashi in army saya, and then a full tsuka (hilt / grip) added at a later date. In any event, as the officer kept his iron tsuba and silver habaki, he clearly was allowed or able some flexibility in the standard pattern, which indicates some seniority of rank or other elitism. The 22 1/2 inch blade has quite a bit of staining (rather than patination per say), that is damp / water damage that has only stained the high quality blade. Even the one small area you could describe as patina or rusting, although there appears to be a few tiny dots of pitting, the steel is completely smooth indicating only the lightest of patination. We have no doubt this blade would very easily be polished by a professional, that it would not need a full polish. The hamon is mostly straight with only a small amount of "activity". The tang is unsigned and there are no stamps. The solid "cat scratch" silver habaki, indicating high value associated with the blade by the original owner, has crumpled a little given it is silver. The iron tsuba is typical of those from the early to mid-1930's, before and during the initial advent of the strict 1934 pattern we are most used to seeing. The tsuka is in very good order throughout. The leather covered steel and wooden saya (scabbard) is in good condition except for the tie holes area of leather which is well worn and torn for a section. The sword sheaths and draws very well, the locking pin mechanism works well. NB: We have replaced the small missing wooden retnetion peg. This is well under-priced. Further / full sized images available upon request. Please quote item reference D89 (770).